As a rule, environmentalists are largely humorless. When it comes to climate, this is compounded by an air of self righteousness, making them prime targets for ridicule. 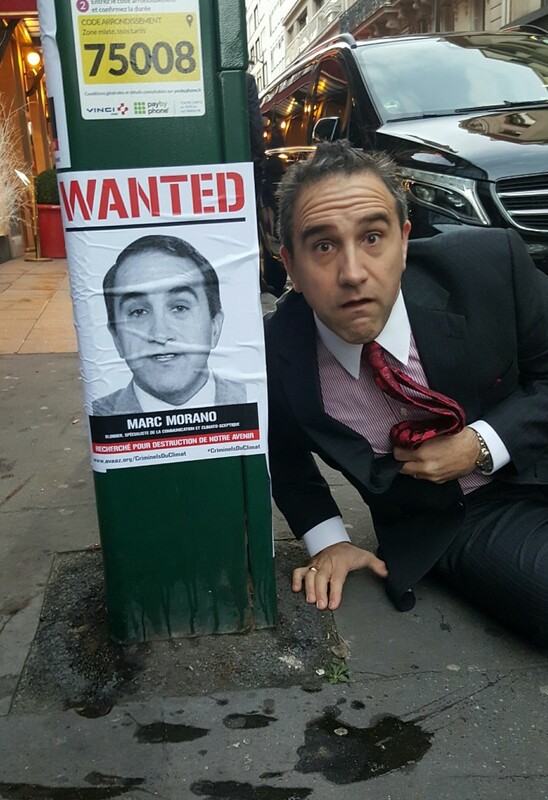 Tonight in Paris we’ll see if Marc Morano is able to take advantage of this. It shouldn’t be too hard. HELPING YOUR ENEMY’S CAUSE? Whoever is behind these posters in Paris, do they realize what they are doing? Have they not heard of Richard Lanham’s book, “The Economics of Attention”? Attention is money. They might as well donate to Marc Morano’s climate skepticism cause to help him with publicity. WHAT’S THE FUNNIEST CLIMATE MOVIE EVER MADE? When it comes to climate and humor it’s pretty much of a contradiction in terms. The only humor in “An Inconvenient Truth,” was Gore making fun of his clueless elementary school science teacher who, “probably grew up to become the science advisor to the current (Bush) administration” (way to alienate the Republicans you’re hoping to reach in the first ten minutes of your movie). There are stacks of climate documentaries over the past decade, almost none of them funny. My friend Robbie Kenner did manage to finally bring a smidgen of humor earlier this year to “Merchants of Doubt,” but only a smidgen as it was still set in the overall holier than thou tone that has characterized the climate movement from the start. There’s actually only one truly brilliant piece of climate comedy over all these years, which is the group in Australia behind, “The Hamster Wheel: Lord Monckton,” a four minute video in 2011 that punked oddball climate skeptic Lord Monckton at a level as skilled or better than “The Daily Show” in the old days. It was a true masterpiece. But all the rest are overly-somber pronouncements on how we’re all doomed — the lecturing voice of a largely humorless community. So now let’s see how they deal with someone making fun of them. In 2008 I took my shot at having fun with the climate issue. Following my movie “Flock of Dodos” in 2006 lots of people asked if I could make an equally entertaining movie about the attacks on climate science. I gave it a shot. I made, “Sizzle: A Global Warming Comedy.” You know what happened? Most environmentalists hated it. The word got out I had made a piece of “climate humor.” Initially there was interest. I was invited to submit it to at least five “environmental film festivals,” in DC, Georgia, California, Wyoming and Colorado. But all of them rejected it. Two of them even wrote emails implying the overall tone of it was inappropriate. Climate bloggers were even worse, and the scientific journal Nature (that bastion of cinema savvy) gave it the only rotten review of my entire filmmaking career out of more than 100 published. In the end we premiered the movie in Hollywood at the Outfest Gay and Lesbian Film Festival (two of the leads were gay and the festival values humor and not taking oneself too seriously) and the Woods Hole Film Festival (they were open minded enough to realize the movie was pro-climate movement, it just had an irreverent attitude, which is largely forbidden in the traditionally reverential environmental world). In 2010 I opened my new blog, The Benshi, with a four part series about Marc Morano which angered a number of climate folks. But I concluded it with a clear warning to watch out for Morano and more importantly to quit debating him on TV. It is a no-win situation to engage Marc in debate. He is faster than any climate advocate, and because he has the power of ridicule on his side, the whole field is tilted. I said back then the only people who should engage with him are trained comedians. A friend of mine with NPR said he was in their newsroom of his studios where the debate was up on the TV live as everyone in the room laughed at Nye while asking about Morano, “who is this guy?” — realizing the power of his ability to attack. He is a machine and has been literally unstoppable over the past decade — just as I warned in 2010. Now, tonight, Marc Morano is in Paris, reaching for his highest achievement to date. Marc enjoyed “Sizzle.” On the Syracuse panel he told about how he received the DVD of “Sizzle” in 2008 just as everyone he knew on Capitol Hill was getting worn down and fed up with the climate issue. The humor of the film proved popular as the DVD was passed around from one congressional office to another. He was intrigued by the power of humor, was intrigued by the power of film, has a natural ability with humor (many of the reviews of “Merchants of Doubt” called him the best thing in the movie, including a kid at the test screening I attended who said, “I know I’m not supposed to like him, but the guy in the movie I’d most want to have a beer with is Marc Morano”). His new movie “Climate Hustle” premieres tonight in Paris. I’m willing to bet money that at least it won’t be boring, which is a whole lot more than can be said for the vast majority of the well intentioned, generally-sucky efforts of environmentalists. I’m not a supporter of Marc’s agenda and never have been, but I do appreciate that he is at least a soldier in the War on Boredom, which is what I think is truly the greatest threat to humanity.